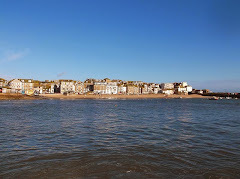 Its been a wonderful Christmas in St Ives. I hope that you enjoy this short film - compiled over the holiday period. A very Happy New Year to all of my blog followers. More great films - news - and other content - coming in 2014. 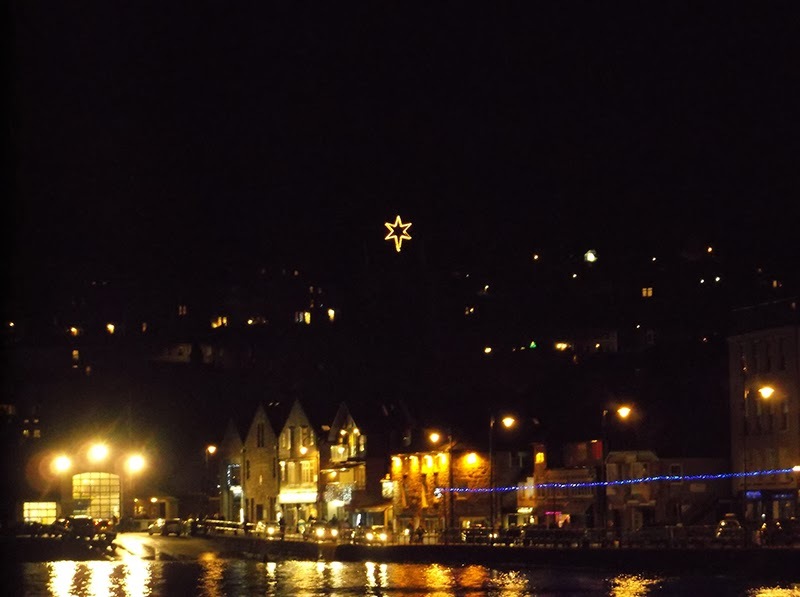 As Christmas approaches - there is lots going on in St Ives. The wonderful Christmas Tree Festival at Fore Street Methodist Church also continues - open every day from 11.00 am. On Tuesday (17th December 2013) St Ives Jazz Club are hosting their annual Christmas Party Gala Night - at The Western Hotel from 8.00 pm. On Wednesday (18th) there is a Christmas Carolaire - at The Stennack Surgery from 7.30 pm. On Thursday (19th) St Ives Farmers Market is open from 9.30 am at The Guildhall. They are also holding a special Christmas Food Market on Saturday (21st). On Friday (20th) its Rollers Roller Disco Christmas Party at The Guildhall. Three sessions - under 12s at 5.00 pm - Teen Skate at 6.30 pm - Over 18s from 8.30 pm. 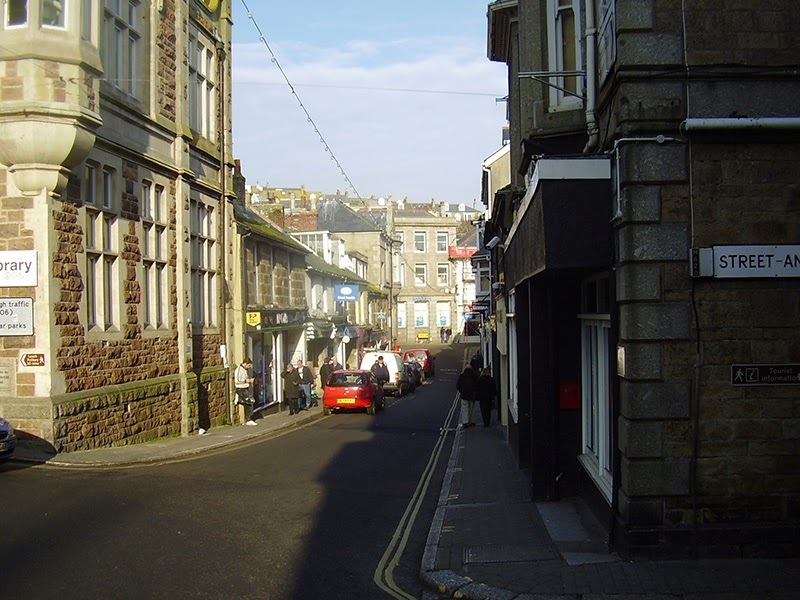 St Ives BID is a proposal to raise money from a compulsory 2% business rates levy - to be paid by all businesses with a rateable value of £5000 or more. A good idea ? Opinions in town vary - but all businesses affected will get a chance to vote for or against the proposal in May 2014. The proposal will only proceed if the majority vote in favour. So the important thing is to be informed and make use of your vote - if you have one - next year. 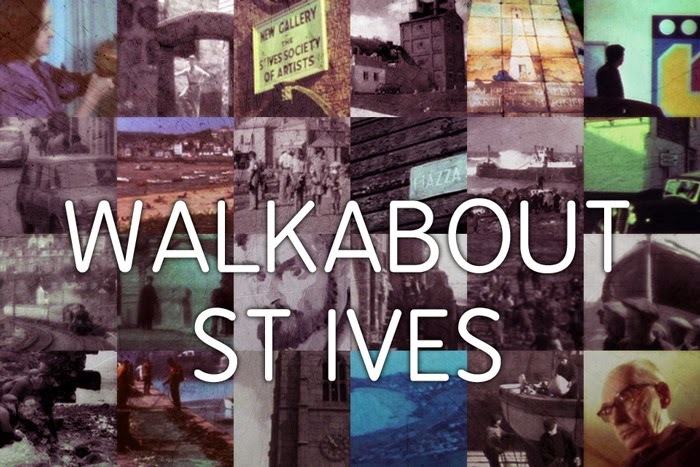 Walkabout St Ives is an Apple i-Phone and i-Pad app that uses a mixture of archive film, art, photography and storytelling to explore St Ives' social history and cultural heritage. Local artist Naomi Frears and fifth generation St Ives fisherman Chris (Bish) Care provide a narrative, sharing their memories and stories from living and working here. Archive film across the years - some from as early as 1904 - brings to life moments in history mapped to locations around the town. The app was developed with help from St Ives Archive and other local arts and history organisations. The smart bit is that it is "location aware" - using GPS to match features to your location. An interactive map or a visual guide can take you to the next place of interest - or you can wander around at will. If you are not in St Ives - "browse mode" provides a virtual tour - you can browse through the content at home or anywhere else - and see the locations without actually being there. 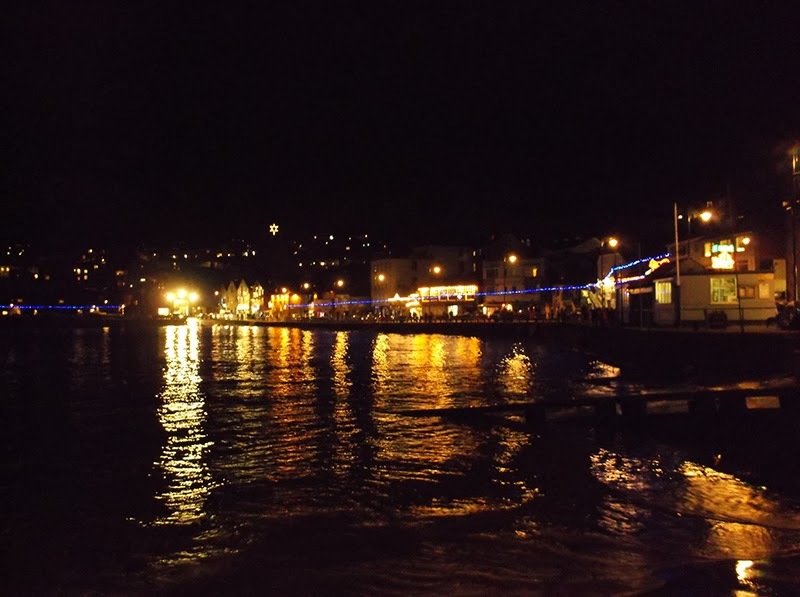 Something to enjoy every day in St Ives this week as Christmas festivities continue. Christmas Tree Festival - Fore Street Methodist Church. On Tuesday evening Friends Of St Ives Library are hosting Christmas Words and Wine. 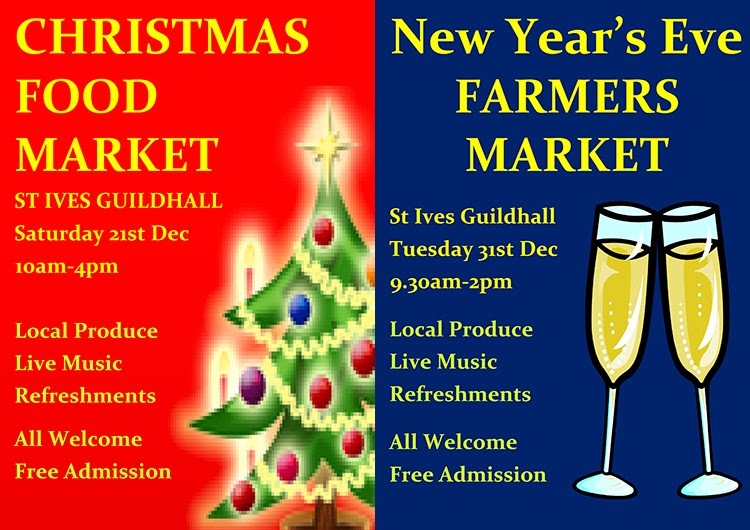 On Wednesday you could do some early Christmas shopping at St Ives Guildhall - Fair Wednesday Craft & General Market. On Thursday its Tate St Ives Winter Festival - free entry to the excellent Aquatopia exhibition - plus Christmas carols and festive art activities for all ages. On Friday - well worth a visit - Winter Exhibition at Cafe Art. St Ives is all lit up for Christmas and looking beautiful. I was out in town last night taking photos - around the harbour, Fore Street and at the Christmas Tree Festival at Fore Street Methodist Church. Any comments and posts of your own photos welcome ! 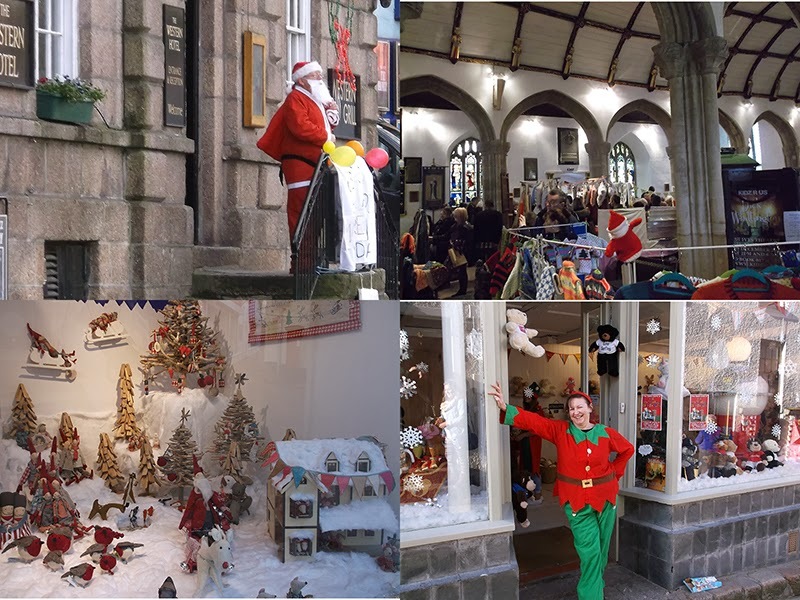 Lots on in St Ives this weekend - with a Christmassy theme around town - here is a selection. Rollers Roller Disco - St Ives Guildhall - 5.00 pm. Christmas Lights Switch On - St Ives Parish Church - 6.30 pm. Christmas Tree Festival - Fore Street Methodist Ch. - 6.30 pm. Christmas Craft Fair - St Ives Guildhall - 11.00 am. Christmas Bazaar - St Ives Theatre - 11.00 am. Puppet Show - Boathouse Theatre - 4.00 pm. Children's Art Workshop - St Ives School Of Painting - 10.00 am. Stories Of The Sea - Tate St Ives - 2.00 pm. Christmas Words & Music - St Ives Arts Club - 7.30 pm. Looking forward to a great weekend ahead in St Ives ! 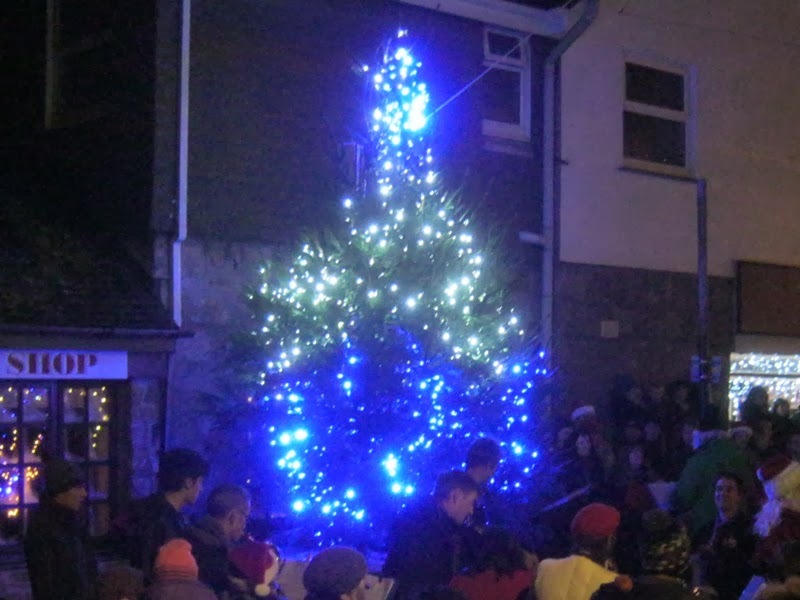 The St Ives Christmas Tree Lights Switch On will be at St Ives Parish Church this year - not in Royal Square as in 2012 or St Ives Guildhall as in previous years. Tomorrow (Friday 6th December 2013) - carols with Kruners Choir from and tree lights switched on at around 6.30 pm. There is no "official" late night Christmas shopping this year - but some shops may choose to open for the evening. 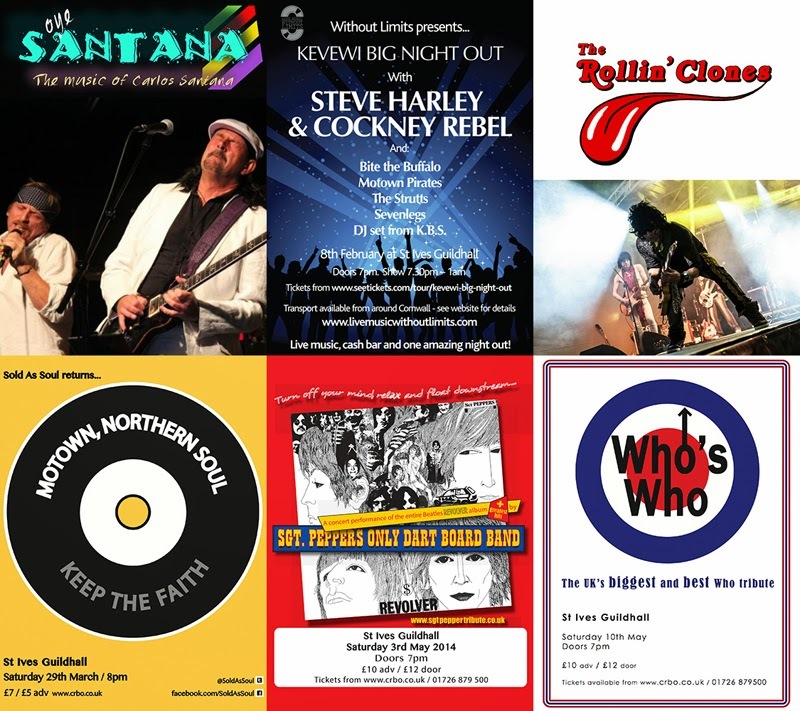 I've been updating the St Ives Guildhall website this week - after a large number of gigs were confirmed. It looks like 2014 is going to be a great year for live music and other entertainment in town. Oye Santana - Saturday 11th January. Steve Harley & Cockney Rebel - Saturday 8th February. Phil Beer - Sunday 16th February. The Rollin' Clones - Thursday 27th February. Tango In The Night - Saturday 8th March. Motown & Northern Soul - Saturday 29th March. Stackridge - Sunday 6th April. The Three Belles - Saturday 12th April. Sgt. Peppers Only Dart Board Band - Saturday 3rd May. St Ives Blues Festival - Sunday 4th May. Who's Who - Saturday 10th May. Martin Turners Wishbone Ash - Saturday 17th May. Richard Digance - Wednesday 25th June. The Alter Eagles - Sunday 27th July. The South - Friday 26th September. Hawkwind - Saturday 27th September. You'll find a navigation bar at the top of the page which will take you to listings month by month. As ever - things can change - so keep coming back to the website for the latest news. We'd advise you to double check before making travel plans or booking accommodation. Christmas festivities in St Ives are now well underway - with Fair Mo at St Ives Parish Church on Saturday - the traditional start to celebrations here. Events continue this week - starting tonight (Sunday 2nd December 2013) with the Community Carol Service at St Ives Guildhall - doors open at 7.15 pm. On Tuesday (3rd) a Christmas Celebration at the parish church starting at 6.30 pm. Carols and music - with local schools and St Ives Community Choir. On Thursday (5th) a chance to do a bit of early Christmas shopping at St Ives Farmers Market - open from 9.30 am. The usual great selection of local produce - and please note that the market returns on the 12th and 19th. There are also two special seasonal markets on Saturday 21st December and on New Years Eve. St Ives Society Of Artists have a Christmas Exhibition running all week and through December. Open daily from 10.00 am to 4.00 pm. 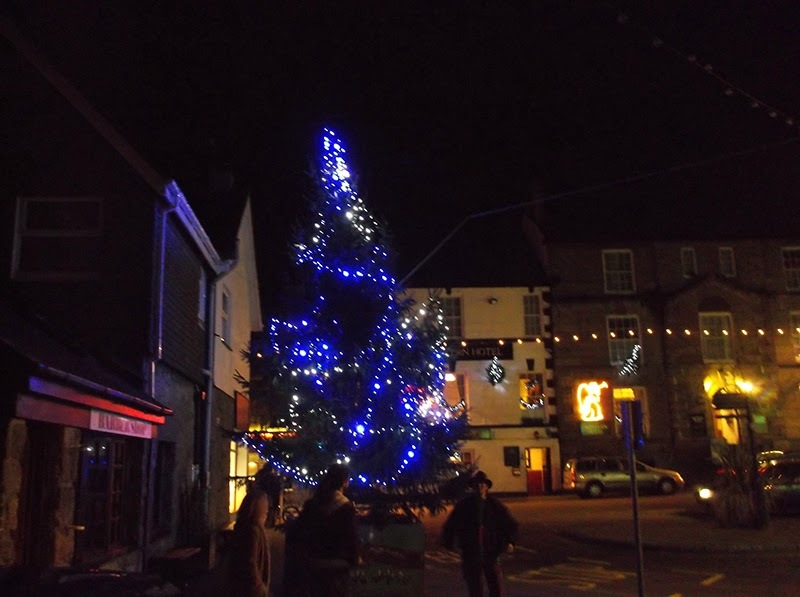 On Friday (6th) its the big St Ives Christmas Lights Switch On - with carol singing from 6.30 pm. This year - for reasons that are unclear - the organisers have moved the event to St Ives Parish Church (according to the notice in St Ives Times & Echo) . Last year it was in Royal Square - and in years previous it was at St Ives Guildhall - both venues seemed to work pretty well. However - a large Christmas tree has mysteriously appeared in Royal Square over the weekend - so if plans change I'll post news here and on my Facebook page. Two other things on Friday that you might enjoy - especially if you have kids. Rollers Roller Disco are at St Ives Guildhall as usual. Skating sessions for under 12s at 5.00 pm and Teen Skate at 6.30 pm. The wonderful Christmas Tree Festival opens at Fore Street Methodist Church. Bot Man Exhibition - Cafe Art - open daily. 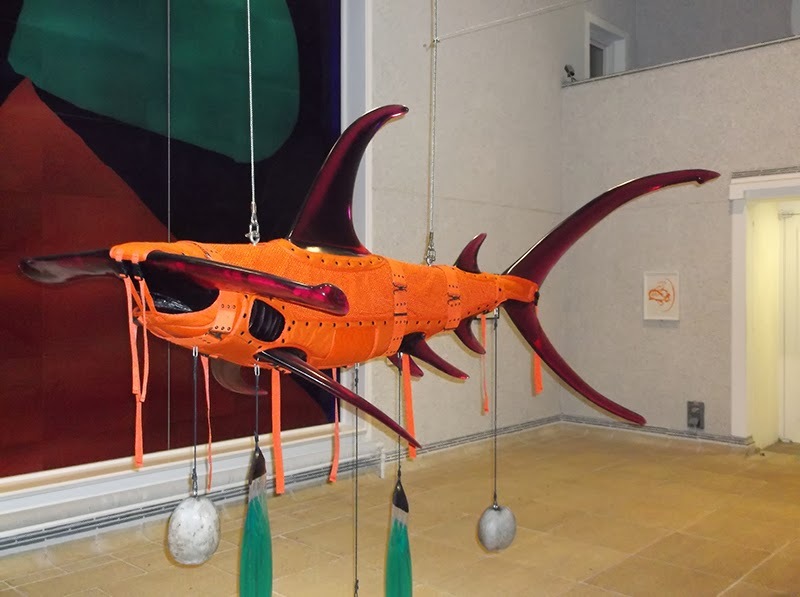 Aquatopia Exhibition - Tate St Ives - open Tue - Sun. St Ives Jazz Club - Tuesday. 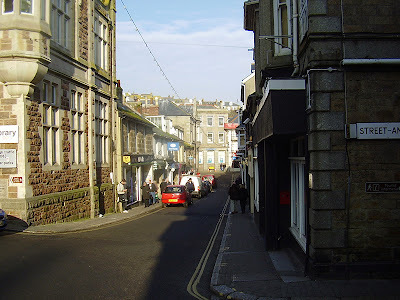 Guided Tour Of St Ives - Wednesday. Penwith Film Society - Wednesday. Tea & Tate - Thursday. St Ives Poetry Circle - Friday. Story Time for Children - Monday. Toddle Tate St Ives - Wednesday. Story Time & Crafts for Toddlers - Thursday. Bounce & Rhyme for Parent & Baby - Thursday.